FREDONIA, Ariz. — Warm and dry conditions punctuated by periods of high winds in early September have resulted in increased activity on the Cat Fire, which is burning approximately 25 miles southeast of Jacob Lake in the Saddle Mountain wilderness. As a result, fire officials re-implemented area, trail and road closures starting Wednesday for both public safety and the safety of firefighting personnel working in the area. In addition to closures, fire managers have ordered additional ground crews to assist with fireline construction ahead of the fire. According to the InciWeb report, the Cat Fire, which originally started by lightning Aug. 6, has burned just under 4,500 acres and remains at 0 percent containment. Containment figures are calculated based on a fire’s interaction with constructed or natural fireline. 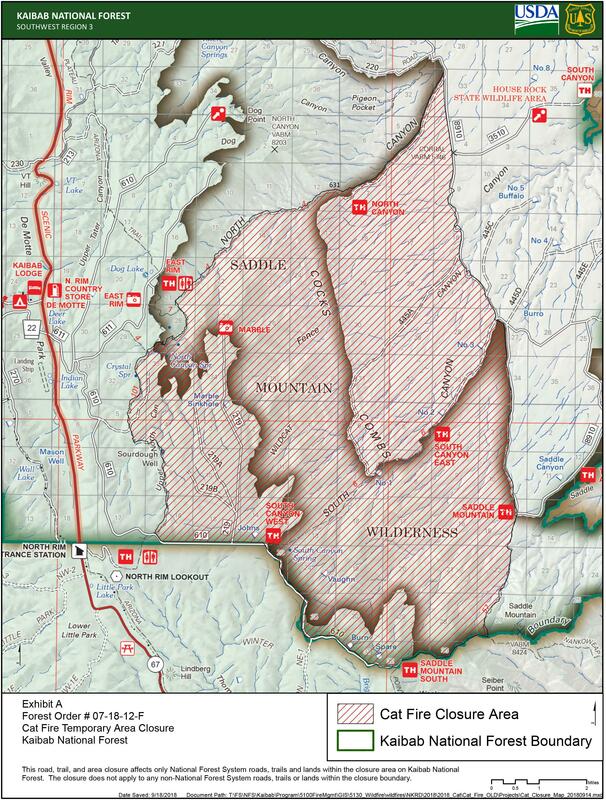 Since the Cat Fire has not burned up to the constructed or natural firelines, no official containment has been reached; however, the fire remains within the initial planning area set by fire managers. The Cat Fire is also exhibiting increased smoke activity. For more information on local air quality resources, click here. The following closures are effective immediately. Once it is determined safe to do so, the order will be rescinded by the Kaibab National Forest supervisor. The Restricted Area is depicted on the included map, and includes the boundary roads and trails described as beginning at the junction of Forest Road (FR) 610 and the Arizona Trail #101, then north to the junction with the Arizona Trail #101 and North Canyon Trail #4, then proceeding east on the North Canyon Trail #4 to FR 631 continuing to FR 8910 Junction. Then south on the FR8910 to South Canyon #6/ Nankoweap Trail #57, then going west on the South Canyon #6/Nankoweap Trail #57 to FR610 continuing west on FR610 to the Junction of FR 610 and the Arizona Trail #101. All trails described above and depicted on the included map and within the Restricted Area, and the Point Imperial Trail (NPS Trail) from the National Forest boundary to FR 610; along the North Canyon Trail #4; along the South Canyon Trail #6; and along the Nankoweap Trail #57. All forest roads described above and depicted on the map, which are identified as the area perimeter; the area within the perimeter boundary is closed. Kaibab National Forest Fire Information Phone Line 928-635-8311.